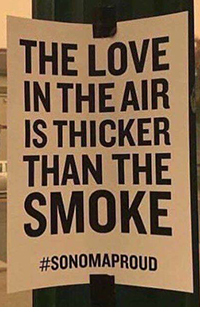 My body may have been in Italy, but my heart and soul were in Sonoma County, my home for nearly 20 years, and it was on fire. The flames that engulfed the area last month are now the worst fire disaster in California history, and I felt like I needed to be there. So I left Italy early, put off Spain for another time and came home. 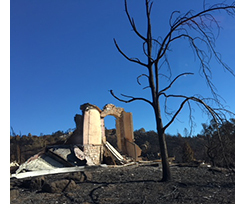 Being here has been both inspiring and heartbreaking, and I wanted to share with you a few stories and insights from the fires and the aftermath. I know it's not my usual article content. It's about "heart stuff" and doorways and people coming together. And it feels important to write about. I hope it touches something for you this weekend. The destruction here was so massive that the numbers are hard to comprehend: 5,300 homes in Sonoma County alone are GONE. Every person who lives here knows someone whose house burned down. Some people know literally DOZENS. That number doesn't even include the beloved restaurants, schools, offices, theater spaces, day care centers, wineries, historical buildings and more. 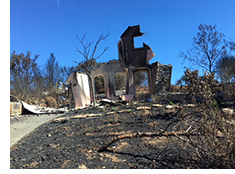 In total, the fires in Sonoma County destroyed 7,010 structures. More than 100,000 people were evacuated at one time or another. In some schools, 10% of the student body -- and teacher body -- lost their homes. Fanned by 80 mph winds, the fire struck in the middle of the night, which made for many harrowing, near-miss escapes. One woman I talked to at the Humane Society had to flee for her life, like many others did, and in doing so, she left 4 cats behind. Her house -- and all the fine woodworking furniture her late husband had made -- went up in flames. Miraculously, she's found 2 of her cats so far and keeps looking for the others. There are Facebook groups of people helping find lost pets. 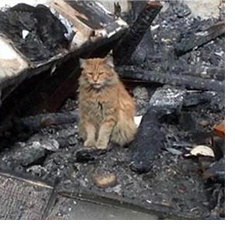 Her cats and other animals that survived were fed by locals who snuck into the closed off evacuation zones. Other people were more fortunate. While their houses may have burned down, they had more time to gather things and loved ones together before leaving. A couple I met at my favorite coffee shop got their 2 cats, 2 dogs and 8 chickens (!) safely evacuated. They laugh at the material things they stuffed in their car with the animals -- for instance, a musical instrument, rather than a computer -- but recognize even now that they wouldn't do it any differently. "It was the heart stuff that really mattered," the woman said. I think we see that in all disasters. People get really BASIC about what matters, and it's always the heart stuff. One fellow, a former firefighter, stayed behind to protect his house, and he knew how. But when an elderly couple walked out of the smoke towards him, he dropped his efforts and packed them into his truck to drive them out of danger. They stopped and picked up another elderly couple walking on the road and eventually, he had to drive through a burning tree to get them all to safety. He didn't hesitate to leave his house to burn. Heart stuff. Another woman I talked to threw a brick through a window to get in and help a neighbor escape. Heart stuff. A husband and wife, shivering in a pool to escape the flames all around them, recited all the things they loved and appreciated about each other and the lives they've shared together. Heart stuff. The heart stuff showed up in thousands of different ways, as people came streaming forward to help, during and after the fires. People whose homes had burned, along with those in non-threatened areas showed up at volunteer centers at 5 am and worked non-stop. Donations of all kinds flooded in. Volunteers jumped in to coordinate volunteers. Chefs and farms collaborated to cook food for evacuees -- for weeks. All the animal shelters coordinated to maximize help. People all over the area offered homes and horse stalls and pastures and everything. Folks are still showing up at dusk to the burned neighborhoods to try to rescue and repatriate cats with their owners. Heart stuff. Now, as those who lost their houses regroup, they have multiple places to go to refurbish their lives. There's even a "matchmaking" website where fire victims can state their needs (twin beds, for example) and administrators match them with someone who has already listed those needed items as available to give. I could go on...it's utterly remarkable. One non-profit put it this way: "As a nonprofit agency that depends upon donation support, we are familiar with our community's deep capacity to give. And still, when it is witnessed at the magnitude we have seen over these past three weeks, it takes your breath away." What's been weird for fire victims is that it's not like one person's house burns down and the neighborhood rallies around them...it's that the entire neighborhood was reduced to ashes. That creates different support dynamics. It's actually widened the feeling of "neighborhood" here to the whole county. This area is just beginning to come to terms with what happened here. There is much grief and probably PTSD to get through. However, even in the midst of that, I witness the most beautiful attitudes. "We're pretending to be snakes," one woman told me. "We're shedding our skin, curious to see what our new skin looks like." What struck me as I drove through one of the destroyed neighborhoods was how so many of the doorways were still standing. All these families, and all these individuals, scorched by the experience of losing, in many cases, literally everything, are walking through their own personal doorway. As you think about them, think about your own doorways. Most of the time, these journeys through doorways into something different are not journeys we embark on voluntarily. They usually involve loss, often heartbreak. Always change. But there IS another side, something new and unknown that awaits us. And there are people willing to support us through that doorway, if we ask for help, or simply recognize the helpers and allow their support. I don't feel I've done justice to the enormity of what's happened here, but I had to write it. If you feel so moved to contribute to the recovery effort here -- to the lives of those affected -- this is where us locals are donating our money. It's a local credit union, and 100% of the funds are being given to fire victims. My wish for you, wherever you are, is that "heart stuff" surround you in every way possible. And may the doorways you step through in your life be ones that bring you awareness of your own resilience and strength and worth...and of how much support is always available to you. P.S. If this newsletter was forwarded to you, and you'd like to subscribe, please click here and enter your name and email at the top right of the page.